NASA astronaut Rex Walheim works outside Europe’s new Columbus lab module shortly after it was installed in February of 2008. ESA is getting ready to celebrate the 10th anniversary of the launch of Columbus. The European lab module blasted off inside space shuttle Atlantis on Feb. 7, 2008, for a two-day ride to the station. 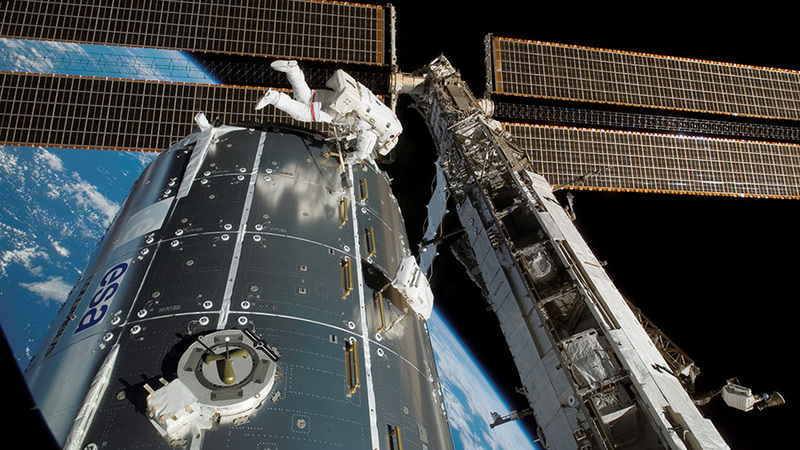 Canadarm2, the station’s robotic arm, removed Columbus from Atlantis’s cargo bay two days after its arrival and attached it the starboard side of the Harmony module. A month after the installation of Columbus, ESA launched its first resupply ship to the station. The “Jules Verne” Automated Transfer Vehicle (ATV-1) lifted off March 9, 2008, atop an Ariane-5 rocket from Kourou, French Guiana. The ATV-1 then took a month-long ride for a series navigation tests before to automatically docking to the station. Astronauts Scott Tingle and Norishige Kanai continued studying mice on the space station for a drug study to potentially improve muscle health in microgravity and despite a lack of exercise. The rodents are housed in a special microgravity habitat for up to two months with results of the study helping scientists design therapies for humans with muscle-related ailments. Flight Engineer Mark Vande Hei set up botany gear in the Columbus lab module for the Veggie-3 experiment. The long-running plant study is exploring the feasibility of harvesting edible plants such as cabbage, lettuce and mizuna for consumption during spaceflight. Samples are returned to Earth for analysis. Determine Factors Behind Astronaut’s Health Deteriorations Firmly during The Space Long Journeys. One of most difficulties to achieve any investigation properly is existence of more than one factor having negative effects of defaulting any machine to do it Functions properly while the action of these Effects Assembly will prevent us knowing The Truth Exactly. 2- Exposure ISS with the Earth’s Magnetic Field at Speed 28000 km/h. 3- Exposure ISS with the Earth’s Gravity Particles at Speed 28000 km/h. 4- Exposure ISS with the Cosmic Rays and particles Fields at Speed 28000 km/h ( which eventually these Cosmic Rays and particles moves at tremendous speeds from their origins). Therefore in order to Determine Exactly which factor creates which kind of health deterioration, there should be a specific lab combines a several Chambers, each Chamber prevent passing a Specific Ray of these mentioned Ray above via covering via a specific metal resist passing in to the chamber, and Observe Carefully health of astronauts to determine Which factors creates which health Deteriorations. In order to Designs a Suitable spacecraft and spacesuit via a suitable Materials and Designs to overcome these changes fundamentally. Also it is important to expand The Ordinarily Investigations in respect to the side effects of these drugs that been used for the astronauts on Earth for long term to determine the exactly their side effects.